Colonel Paul Marnon graduated from the University of North Georgia and was commissioned an Aviation Officer in 1987. After attending the Aviation Officer Basic Course and the Army’s Rotary Wing Flight School, he was qualified in the AH-64A Apache and was assigned to 1st Battalion, 82nd Aviation Brigade, 82nd Airborne Division at Fort Bragg, North Carolina. Early assignments include Attack Helicopter Platoon Leader, Regimental Aviation Officer for the 504th Parachute Infantry Regiment, and Battalion Assistant S3 between 1989 and 1992. As an Attack Platoon Leader, he served in Operation Desert Shield and Desert Storm from August 1990 to April 1991. Following attendance at the Infantry Officer Advanced Course and Ranger School, he was assigned to 1stBattalion, 1stAviation Regiment, 1st Infantry Division, Katterbach Germany, serving in numerous positions including Attack Helicopter Company Commander, Aviation Unit Maintenance Company Commander, and Battalion Operations Officer from 1993 to 1997. During this assignment he was deployed to Bosnia in support of NATO Stability Operations at Tuzla Airbase Bosnia-Herzegovina. 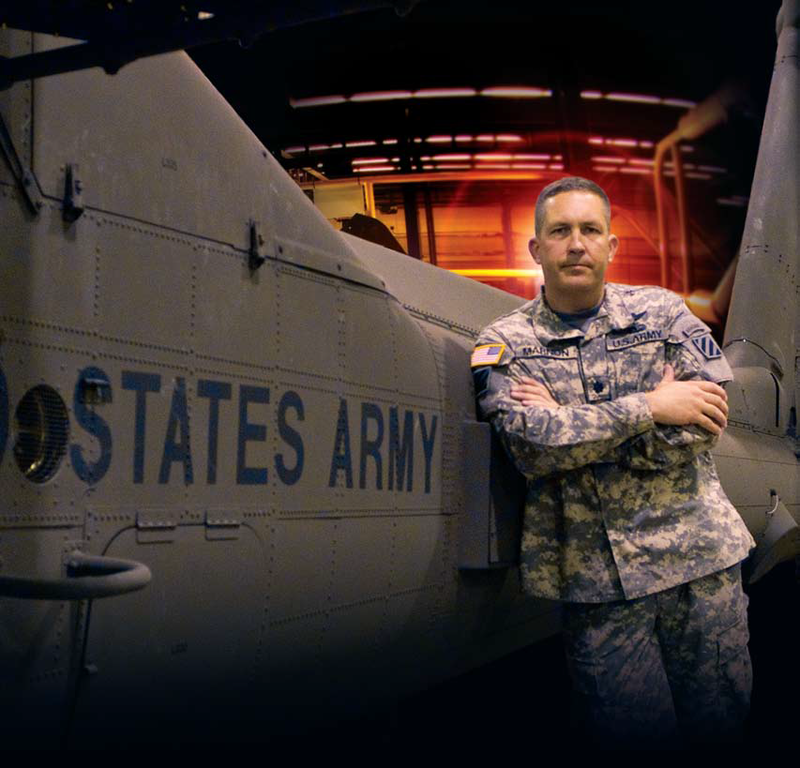 Following this deployment, he was assigned to the National Training Center, Fort Irwin, California where he served as the Senior Aviation Operations Trainer from 1998 to 2000. Following graduation from the US Army Command and General Staff College, he was assigned to the 229th Attack Aviation Regiment, Fort Bragg, as a Battalion Operations Officer, Battalion Executive Officer, and Regimental Operations Officer from 2001 to 2004. While assigned to the 229th he deployed to Afghanistan in support of Operation Enduring Freedom 3. After his return from Afghanistan he was assigned to the US Army Aviation War fighting Center, where he led the Army Aviation doctrine writing effort for the United States Army. In June 2006, he assumed command of 1st Battalion, 3rd Aviation Regiment, 3rd Infantry Division, Hunter Army Airfield. As the battalion commander, he deployed with 3rd Infantry Division to Operation Iraqi Freedom for 15 months in support of U.S. and Coalition forces in Iraq. Immediately following this deployment he returned to the National Training Center where he served as the Senior Aviation Combat Trainer and the Deputy Commander for NTC’s Operations Group. Following attendance at the Naval War College in Newport Rhode Island, Colonel Marnon was deployed to Afghanistan once more, responsible for Coalition and US Rotary Wing Plans and Operations for NATO’s Joint Command Headquarters in Kabul. Immediately following this deployment he was assigned as the Deputy Division Commander for the Pacific Training Division, 75th Training Command, Camp Parks, California. Colonel Marnon was successfully deployed on 5 combat tours of duty, 12 months each, ranging from Platoon Leader to NATO/Joint staff senior executive. Over 3,000 hours of attack helicopter experience flying in extremely hazardous combat conditions. During this time he also established comprehensive Safety procedures resulting in 80% accident rate reduction, following the worst accident year for aviation since 2002. Colonel Marnon holds a Bachelor of Business Administration from the University of North Georgia, an Army Command and General Staff Course from Command and General Staff College, a Master of Arts in Procurement and Acquisition from Webster University, and a Master of Arts in National Security and Strategic Studies from the Navy War College. In November 2015, Colonel Marnon retired following 28 years of active duty service. He completed his military career as a Master Aviator, Ranger, Airborne, and Air Assault qualified. He has successfully transitioned his career into the private sector, accepting a position as a senior executive with Intevac Photonics, a technology leader in the development and manufacture of compact, cost-effective, high-sensitivity digital-optical night vision sensors, cameras and systems for the defense industry, combining state-of-the-art semiconductor photocathode technology with silicon-based digital video technology. Paul Colonel Marnon and his family decided to make Dublin California their home. He continues to serve, both as a Board of Directors member and as a volunteer Pilot for the Vietnam Helicopters Museum.